Greetings and salutations, people of the far future who are somehow seeing these posts despite the Great Electromagnetic Pulse Catastrophe of 2029, which wiped out everything not stored in a Faraday cage, which was a lot because most people thought only paranoid delusion people believed such things could ever happen. 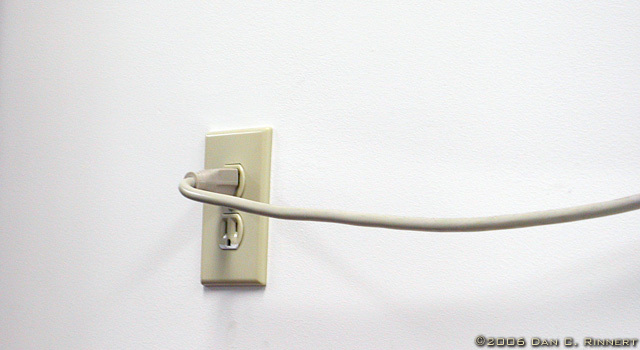 At any rate, before the advent of wireless electricity, we had these things called electrical outlets on our walls, into which we plugged power cords to power our devices. That is what you see in the picture. Of course, you’re probably not even looking at a picture but instead having the image downloaded directly into your brain. Weird. We don’t have that yet. I hear, though, that they are working on telepathic books. I should look into that. Might be worth investing into.